And so it was that Mike was the second person I sought out at the puzzle party the next morning… he was sharing a spot on the end of Bernhard’s table and had a copy of Crosslinks coyly wrapped in Clingfilm in the corner of the table. When I asked if there were any left for sale, he offered me a choice of woods and after running through all the choices I did the obvious thing and selected the very first one he’d mentioned. A little money changed hands and I packed a Clingfilm-wrapped thing of beauty into my rucksack…with a fat grin on my face. Flash-forward several days and I’m back at home and it’s one of the first puzzles I haul out and play with. [When I got home I took the obligatory puzzle-haul shot on the dining room table, then packed them all into three plastic crates for temporary storage up in the puzzle cave until I get a chance to play with them, photograph them (possibly even blog about some of them!) and then give them their proper place in one of the ever-more crowded cabinets.] The puzzle arrived disassembled so the first job is to work out how it goes together. My memories of it at the competition are that there’s a pair of interlinked rings on a stand, so I set about trying to work out how the two ring-bits fit together. First impression is of just how exacting the ring pieces are – the tolerance between the pieces is incredibly fine – so they need to be perfectly aligned to get them to start going together… and then you realise there’s something stopping you from doing what you’re wanting to do… then the puzzling begins. Find how to deal with that and you end up wishing for an extra hand at one point, until you finally manage to lock it all in place… at which point it looks really bloody gorgeous… begging you to play with it … and when you’re suckered in, you realise you have no choice now but to solve the thing! Mike’s work is always pretty special but I find this puzzle to be particularly beautiful – this one’s going to invite and challenge puzzlers visiting my puzzle cave for many a year … Bravo Mike – it’s gorgeous! So just before IPP we had a few folks staying over and a couple more (!) 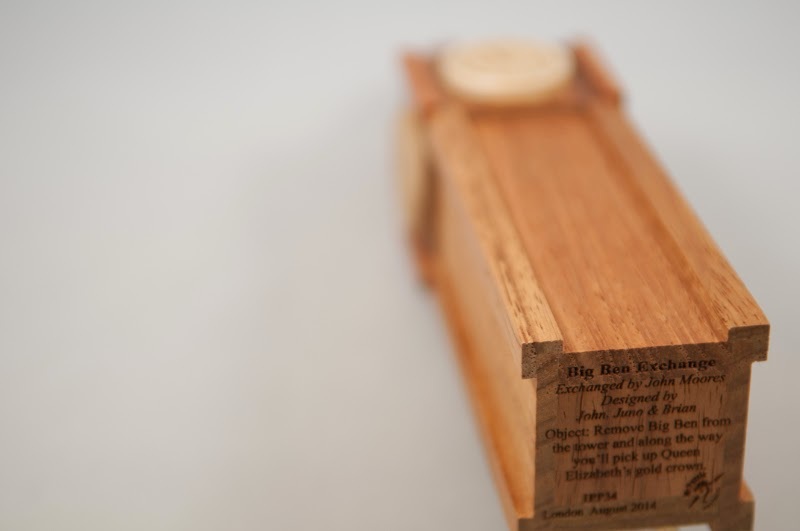 arrived for a braai … and two of those people each gave me a rather beautiful puzzle box – and I reckon it’s only fair for me to share them on the blog so that the folks who didn’t make it can see them too. 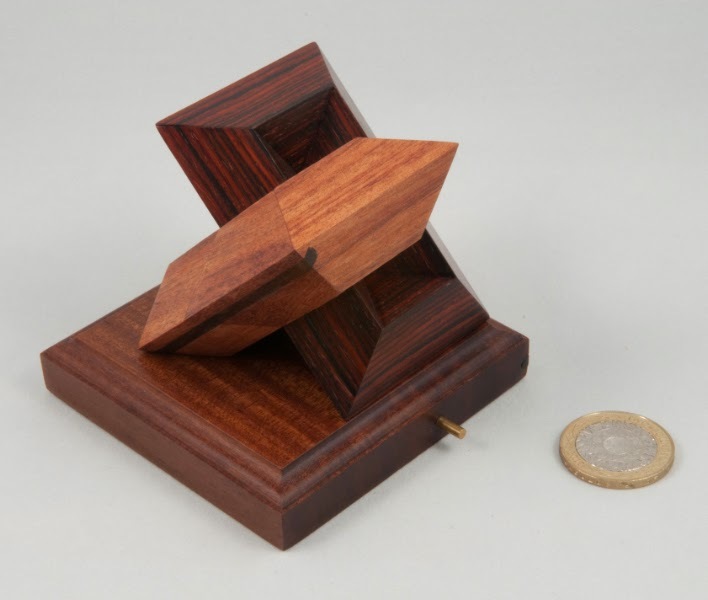 First up is Peter Wiltshire’s 2014 Nob Yoshigahara Design Competition entry called the Golden Ratio Box. I first met Peter and his lovely wife Lesley in a bar in Washington DC (OK, so it was the lobby bar at the IPP hotel before you go assuming anything…). I’d ‘met’ him in the virtual sense through the Renegades forum before then, and within a few minutes of meeting him, he’d given me a copy of the Sway Cube that he’d made to dish out to first-time IPP-attendees. Now Sway Cube is reasonably uncomplicated in a mechanical sense, but it relies on accuracy and a good fit for it to be puzzling … and Peter’s craftsmanship and tolerances are pretty spectacular, so it was a lovely little challenge. That year he’d entered his Ferris’ Box in the Design Competition where it won a Jury First Prize Award – the ideas behind the mechanism are really unusual and surprising and once again, the execution was exceptional, making it a wonderful puzzle to play with …when he made a few extras and then sold a few of them I made sure I didn’t miss out. As you might expect, the Golden Ration Box’s dimensions all satisfy the Golden Ratio … in fact there are a number of subsidiary dimensions in the features that satisfy the ratio as well…and while that may have been important to Archimedes and his mates many centuries ago, I’ll be honest and say that it’s the craftsmanship and the woods that makes this such a beautiful object for me rather than (just) the ratio of the dimensions. Peter’s used Roasted Birdseye Maple for the main panels and it is simply stunning. 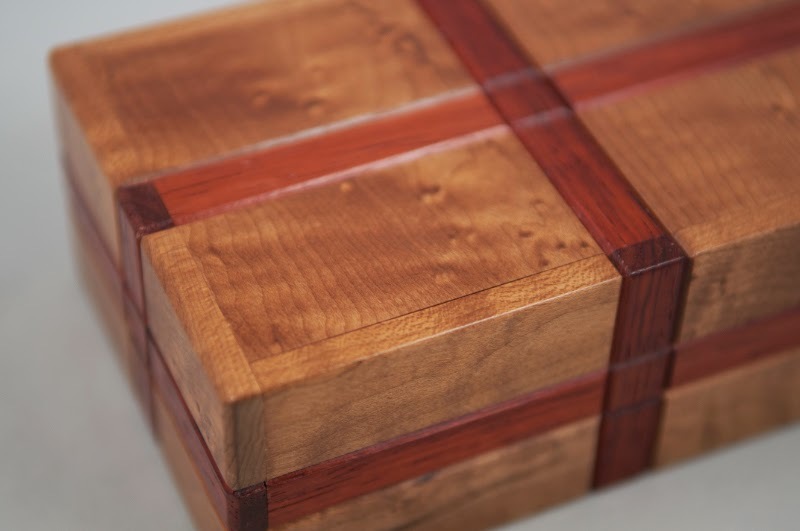 Birdseye Maple is pretty nice to start out with, but the roasting makes the colours and the figuring significantly deeper and even more beautiful – I’ve never seen this wood before, but I’d be hard-pressed to think of a better looking one now. OK, OK, so it’s good-looking – tell us about the puzzle! I spent quite a long time trying to find the first “move” – while I was looking for it, I found some promising signs of what might happen later… but the first move evaded me for a long time… and when I finally started to think along the right lines, I needed a bit of encouragement from Peter to actually execute it. 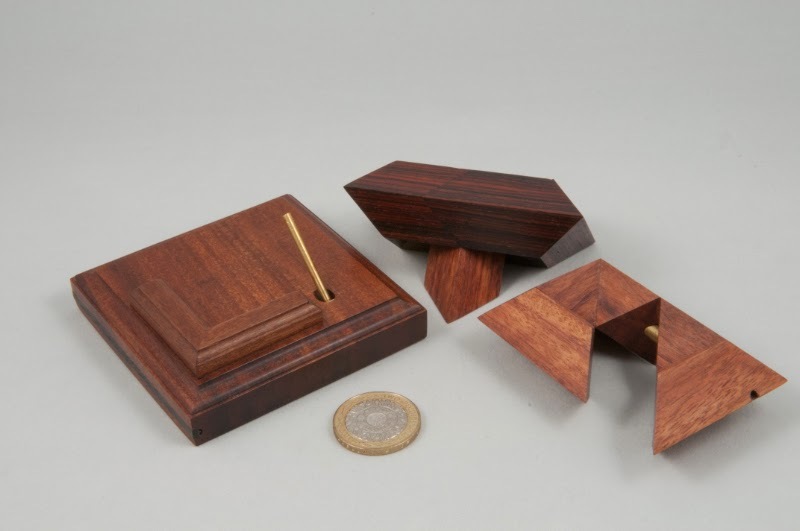 It is a very unusual way to start opening a puzzle box and the tolerances between the various bits mean that you have to get it spot-on before it’ll yield. 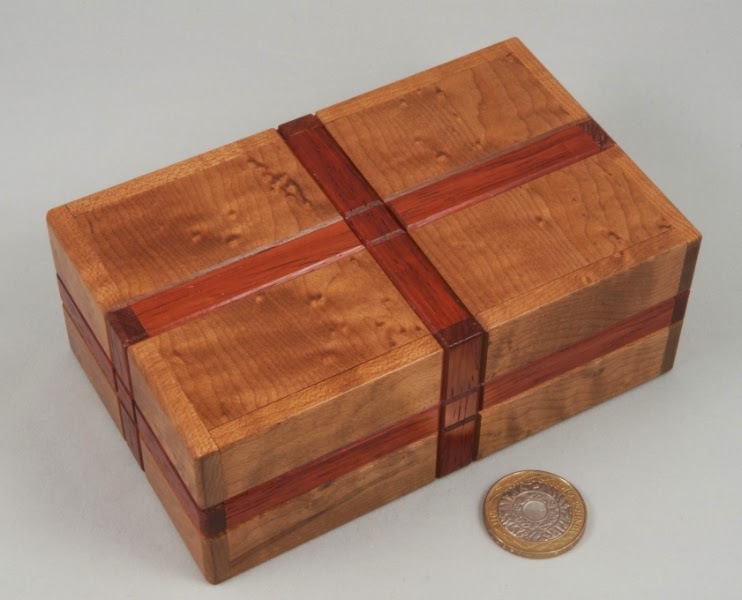 Once you’re past “that bit” it behaves a bit more like a “standard” puzzle box and soon enough you’ll have several compartments opened and the box looks nothing like it did when you first started. Once again the fit between the bits that move is simply sublime … the only clues I managed to spot along the way turned out to be the very last pieces to move, and I thought they’d be moving in a different direction! 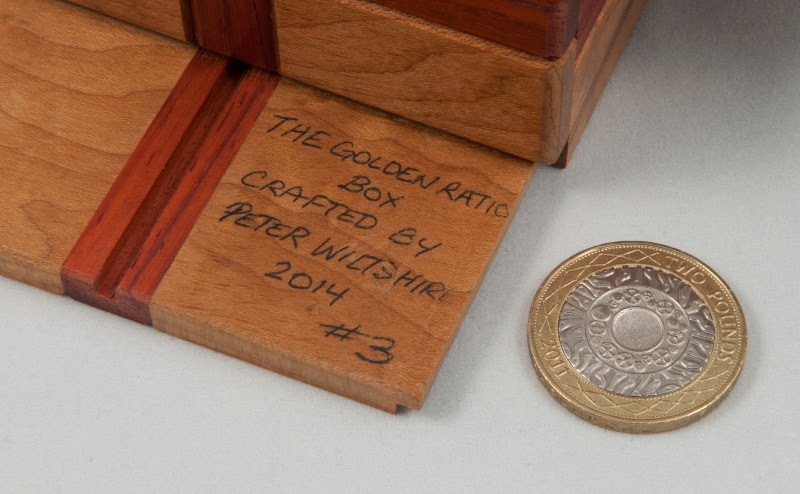 Peter’s craftsmanship on the Golden Ratio Box is pretty special – it’s hard to believe this is just a hobby for him, but it’s pretty easy to see why it earned him a Top Ten Votes Award in this year’s design competition – it’s a pretty special creation … thanks Peter, I absolutely love it! Next up is Reversal of Fortune designed and crafted by Jeff Aurand – host of the annual Rochester Puzzle Picnic held just after IPP each year. Now the RPPs make our MPPs look tame by comparison – they may only happen once a year, but they seem to start on the Friday evening and last until Sunday and I heard rumours that a number of folks would be camping in Jeff’s backyard this year, prompting talk of changing it from RPP to Puzzle-stock. Each of the drawers in the Chest is special in their own right and Jeff’s Reversal of Fortune is no exception. Made largely in walnut, the top has a Quilted(?) Maple inlay in the centre of it that looks stunning. 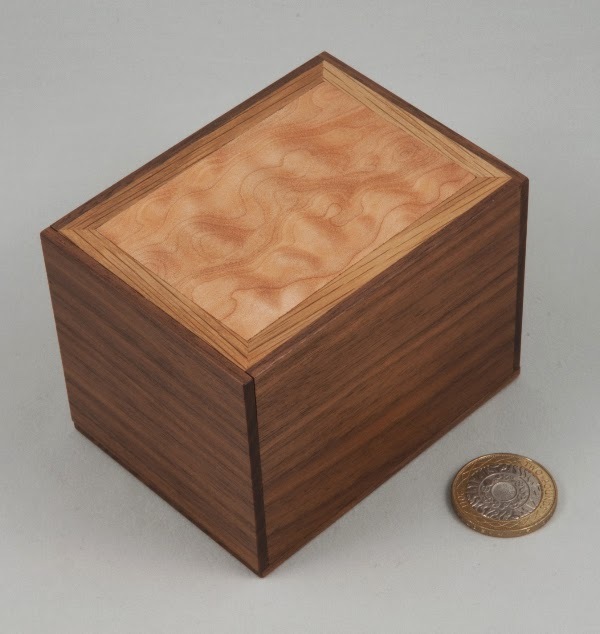 I’ve never come across anything that Jeff’s crafted before, and having seen the quality of this box, I cannot believe that he’s only recently started making puzzles and must believe that either I’ve been deficient in my puzzle-hunting skills up to now, or he’s just been making puzzles for himself and a few friends. This is a beautifully crafted puzzle with a very unusual mechanism that must have taken no small amount of engineering to create. The box’s name alludes to a couple of sections in the solution – the final one being a lovely little piece of theatre in your hands – wonderfully unexpected! 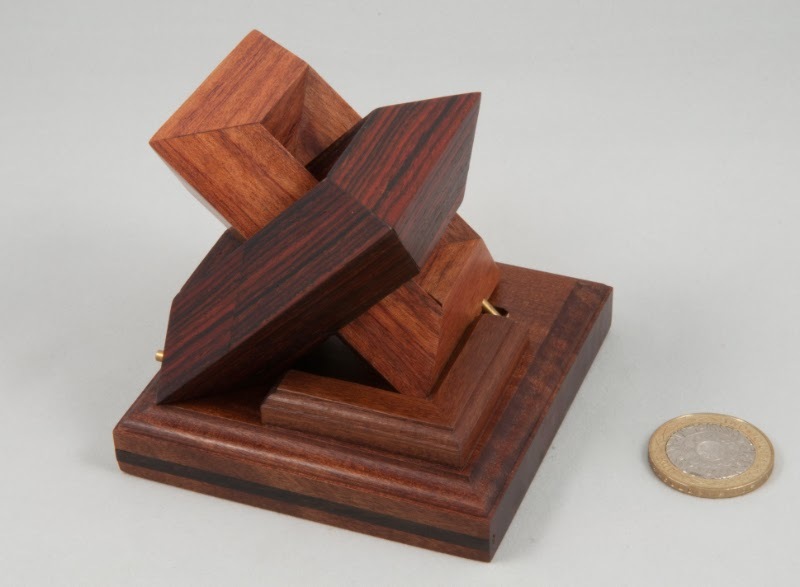 The first move or two make it seem like a reasonably standard puzzle box, albeit one of them feels little different and has a touch of a metallic feel to it… a few steps in and you find yourself needing to change direction (the first reversal). A few more moves and things start looking very unconventional, and when you open the box you know you’re not in Kansas any more! The final reveal is a wonderful surprise and caps off the series of reversals beautifully. 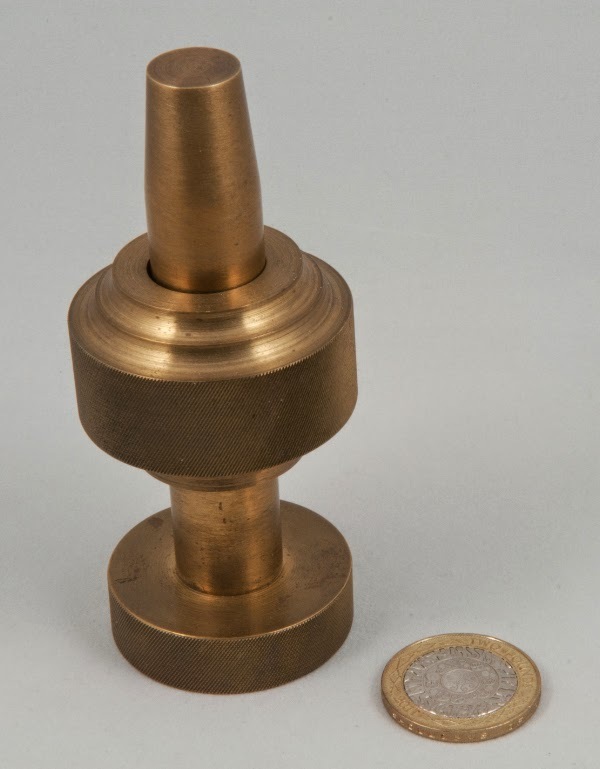 Recently I got quite lucky when I was offered a couple of original Marcel Gillen puzzles –a Fire Plug, Dumbbell and a #6 Bolt - neither of which tend to appear for sale very often. 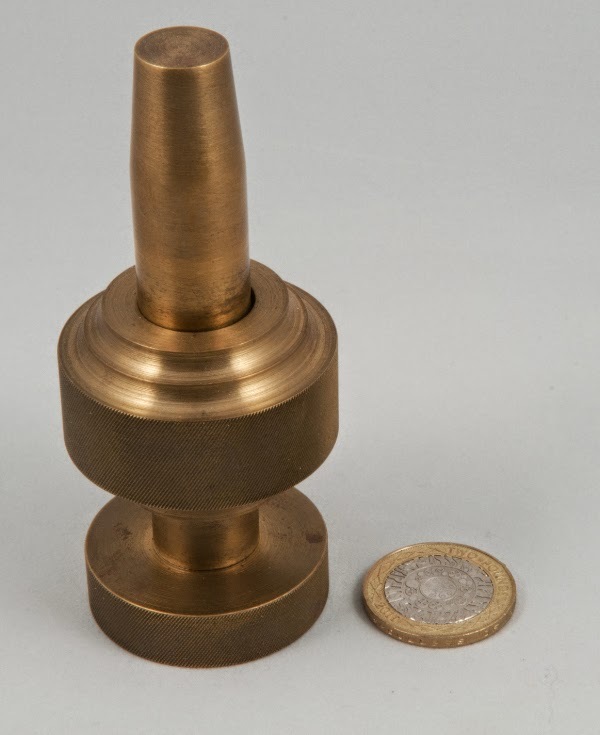 Fire Plug was first available back in 1999 and Bits & Pieces produced a version for a while, but these days your only means of getting one is through an auction or privately. I’d seen and fiddled around with a copy of the Bits & Pieces Fire Plug at one of our MPP gatherings, but hadn’t got very far on solving it. I picked up my copy of Fire Plug at IPP and managed to get some time to play with it about a week or so later. First thing you notice is that the original version is quite a bit larger than the Bits & Pieces version – it’s a big lump of metal! 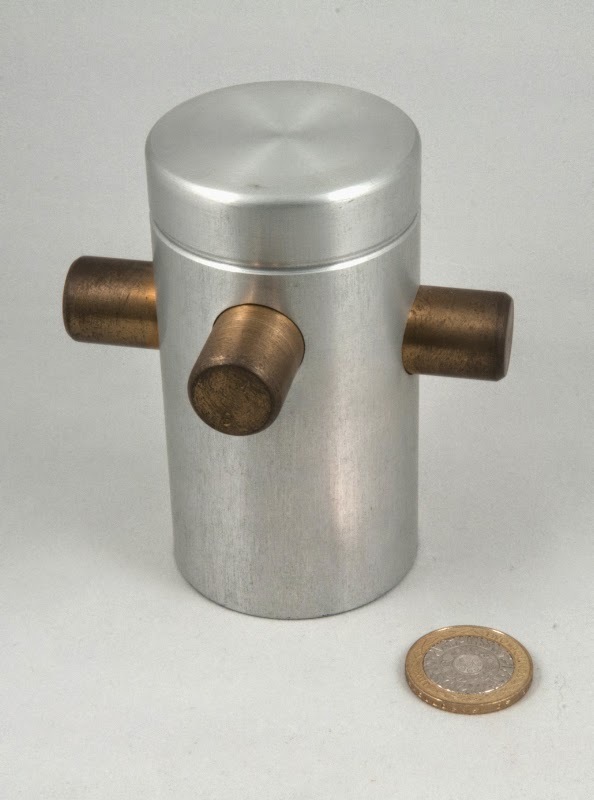 It’s an aluminium cylinder in two parts locked together by a pair of sturdy brass rods that clearly interfere with one another inside the cylinder…your goal is to open the cylinder and, at least in the Bits & Pieces version, release the firehouse mutt inside. Fiddling around with the brass rods seems to be the obvious place to start as there’s precious little else to play with on this puzzle. There’s a great sense of progression as you work out what you’re trying to do with the rods and all-too-often it will dump you right back at the start again. Find your way all the way through, and you’ll be rewarded with removing the rods and opening the cylinder. Next up is the Dumbbell – I’d been offered one of these a while back but my puzzle budget was a little tapped out at that stage, so it ended up going to a mate of mine who’s rather chuffed with it… when the second one came along I was in a position so say yes please and grabbed it. 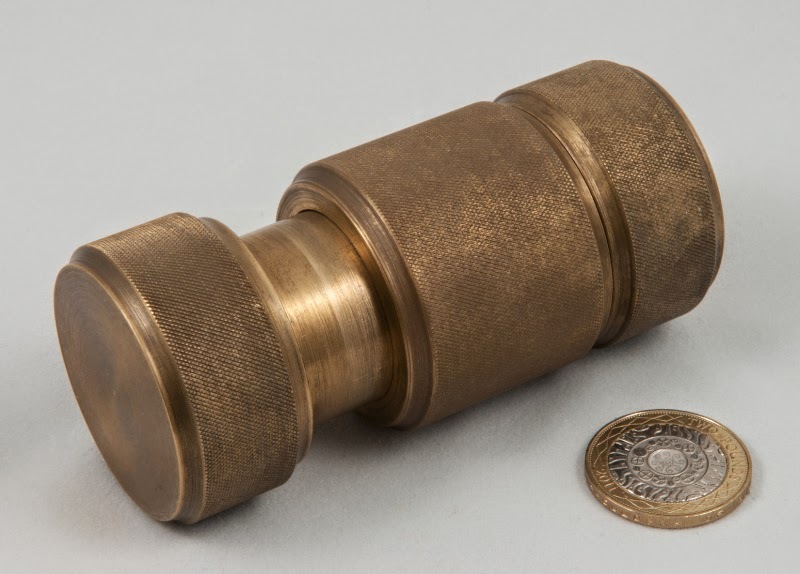 This one might be a little smaller than the Fire Plug, but it’s virtually solid brass, so it’s a heavy little brute. 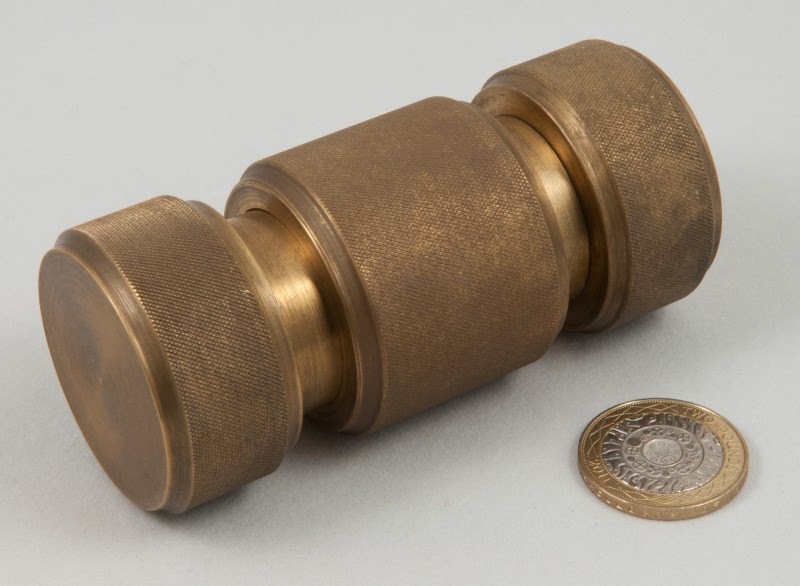 It looks a bit like a dumbbell inasmuch as it has wider bits at each end, but there’s also a brass collar trapped between the two ends that seems to have pretty free movement in one half of the available space – and won’t travel into the second half at all. Playing with this puzzle is a lovely series of subtle discoveries – it’ll be totally predictable almost all of the time, then all of a sardine it’ll do something you weren’t expecting – and as a puzzler you recognise those as the tiny little clues to where to investigate next – sometimes with no idea how to investigate them or indeed how they might be useful. Ultimately it only requires a small number of “moves” but they are beautifully hidden in unexpected places and in some brilliant craftsmanship – the last “move” had me doubting whether I was seeing things when something unexpected happened – the machining is that good! The last in my latest little Gillen-haul is another of Marcel’s Bolt Puzzles. I’ve previously written about the other three I managed to find a while back – and I wasn’t going to pass up on the opportunity to add another to my little set. 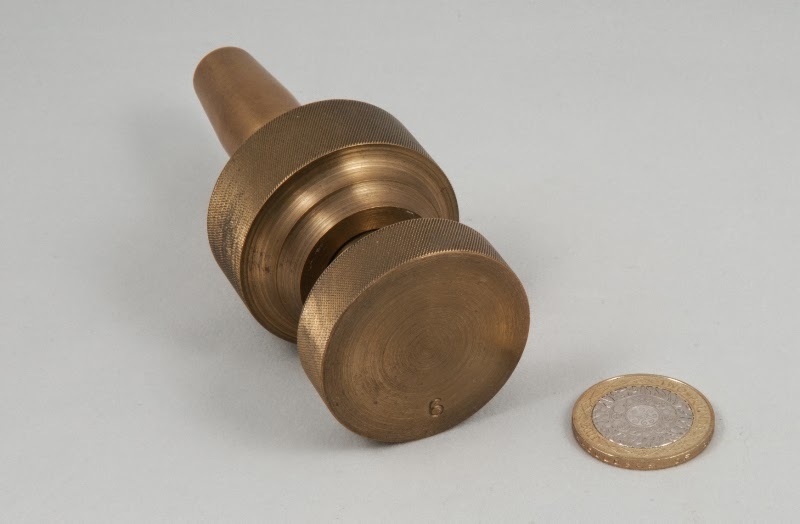 Bolt #6 looks a lot like the other bolts – it’s a big machined brass creation that might pass for being a massive industrial-sized bolt if it had any thread at all on the shaft – but none of them do… and the nut is more of a large, heavy brass collar… but we’ll call them bolts, shall we? Having solved my few, and played with most of the rest of them down on a visit to James’ collection, I knew that while they might look alike on the outside, they are all rather different puzzles… and they build on the tricks of the earlier puzzles. Bolt #6 starts with the collar in a particular orbit and without a huge amount of trouble you can get it into a higher (partial) orbit – but that doesn’t seem spectacularly useful – and the nut is nowhere near coming off at this point. Working out how this might be useful, and how to use it is the guts of this puzzle… I found that thinking about it “the right way” was the key to solving it – but even then it’s not a trivial solve, requiring a reasonably precise execution of your plans… make an error along the way and you’ll find yourself right back at square one. Four down – four to go? Let me pin my colours to the mast right up front: I think Big Ben is the best exchange puzzle from IPP34. No I haven’t played with all of the others yet, let alone solved them all, but I am pretty confident that when I have worked my way through the couple of crates of exchange puzzles in the puzzle cave, I will come back to this statement comfortable that it hasn’t been disproved. Big Ben is THAT good. 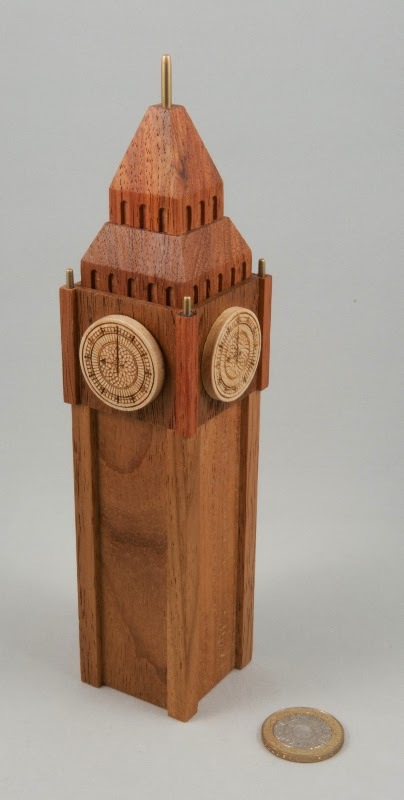 Big Ben was John Moores’ exchange puzzle at IPP34. It was designed jointly by John, Brian Young and Junichi Yananose and then manufactured by the latter two gents down-under in Mr Puzzle’s lair. John’s patter in the exchange explained that your goal was to find Big Ben, which as everyone should know is the bell inside the clock tower and not the clock or the tower itself. Along the way you should discover the Queen’s lost crown and one or two other items that might be useful… he described it as a sequential discovery puzzle (my favourite!) and said he hoped I enjoyed it, with a bit of a grin on his face that suggested he already knew I was going to … and with good reason. I’d heard rumours that Brian felt it was on a par with his Opening Bat and was a puzzle he was massively proud of… that alone says a lot! From there I made some progress to the next main phase of the puzzle and then once again found myself stumped for a while…I love puzzles that give you a bit of progress, then stump you again at the next corner. When I worked out what the next section actually was, it didn’t take too long to get through it, although there are some opportunities to spend a lot longer in there than strictly necessary as well… I managed to avoid wasting a lot of time in there, which was good. When you’ve partially disassembled the tower, things get really interesting. Definitely time to get your thinking cap on! The solution to the second half of the puzzle is really glorious… requiring the detective skills of Poirot and the imagination of Heath Robinson. At one point near the end of the solution I was pretty certain I’d recognised what I needed to do, but things didn’t quite work properly … until I in-spanned a few more of the little grey cells and realised something beautifully subtle, and then had her top off in a flash, and Big Ben dropped neatly onto the desk. This is a seriously classy puzzle. The fact that John was giving them away in the exchange says heaps about the man – I trust he’ll get a huge kick out of the puzzlement that he provides to his fellow puzzlists as a result. Thanks John – it is EPIC! 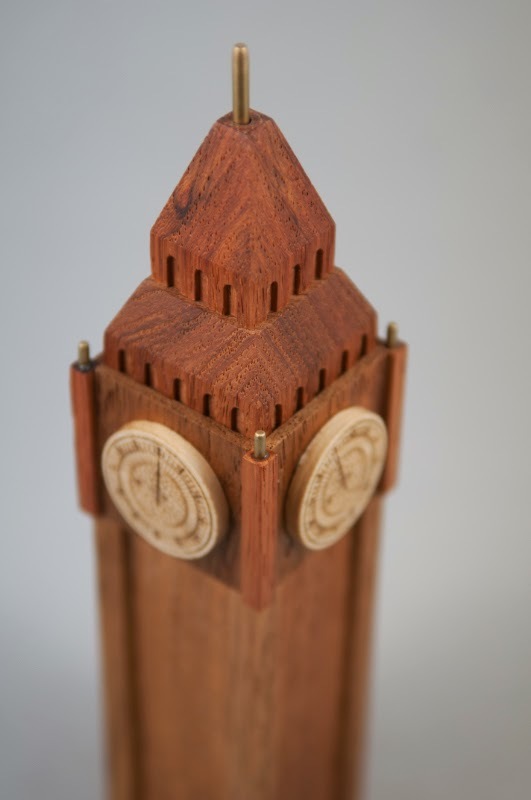 Kevin’s already done a write-up of Big Ben over on his blog – read it! Then keep an eye on Brian’s web-site and buy one – you won’t be sorry! Brian's site's just been updated and you can buy a copy of your own over here.